To Mark 10th Anniversary Of Iraq Invasion, Researchers Assess The Cost : The Two-Way Researchers say the war will cost the U.S. $2.2 trillion, a figure that far exceeds the original government estimate of $50 to $60 billion. If you factor in borrowing costs, the U.S. will end up paying nearly $4 trillion for the invasion. 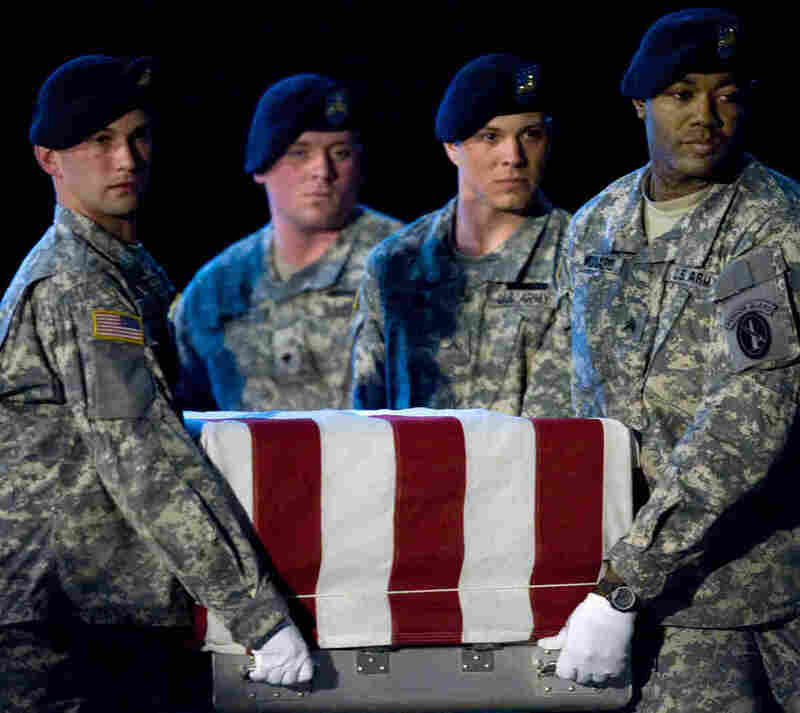 Members of the US Army's Old Guard carry team lift the remains of U.S. Army Specialist Israel Candelaria Mejias from San Lorenzo, Puerto Rico, as his body is returned on a C-17 to the U.S. from Iraq on April 7, 2009. Nearly ten years since the United States invaded Iraq, researchers at Brown University are assessing the cost of the war. "According to the report, the war has killed at least 190,000 people, including men and women in uniform, contractors, and civilians and will cost the United States $2.2 trillion — a figure that far exceeds the initial 2002 estimates by the U.S. Office of Management and Budget of $50 to $60 billion." That 190,000 people were killed directly by the war and includes 4,488 U.S. service members and 134,000 Iraqi civilians. The total of indirect deaths — due to disease or injury, for example — could be "several times higher." The Watson Institute first took a stab at estimating the cost of U.S. wars back in 2011. As we reported, they found the U.S. had already spent "around $3.2 to $4 trillion" on the conflicts in Afghanistan, Iraq and Pakistan. In the report released Thursday, researchers also calculated that if you include cumulative interest through 2053, the total spent for the Iraq war is almost $4 trillion. -- "Terrorism in Iraq increased dramatically as a result of the invasion and tactics and fighters were exported to Syria and other neighboring countries." -- "Iraq's health care infrastructure remains devastated from sanctions and war. More than half of Iraq's medical doctors left the country during the 2000s, and tens of thousands of Iraqi patients are forced to seek health care outside the country." -- "The $60 billion spent on reconstruction for Iraq has not gone to rebuilding infrastructure such as roads, health care, and water treatment systems, but primarily to the military and police. The Special Inspector General for Iraq Reconstruction has found massive fraud, waste, and abuse of reconstruction funds."